Every night in bed my daughter cuddles up to her favourite softie, a handmade cat in a darling dress that my grandmother made for me when I was young. It is what all softies should be – a lovable and huggable companion for playtime and sleeptime. It’s what this softie from Etsy shop Pink Nounou has in abundance. But it’s also so much more than that – it tells a story and is beautiful to boot. 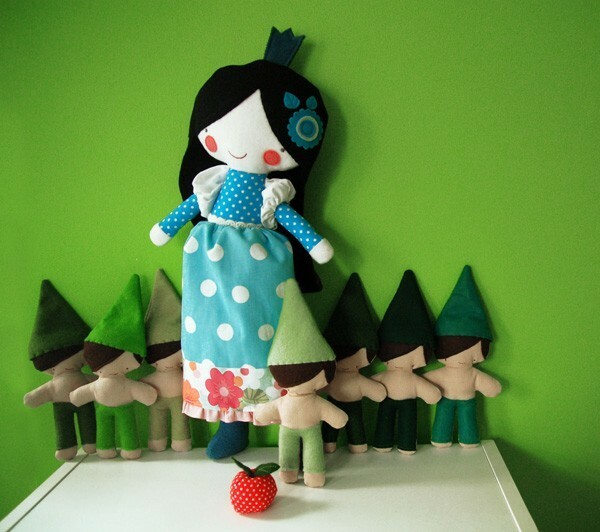 The first offering from Pink Nounou’s ‘Softies and Tales’ collection is Snow White and the Seven Dwarfs, a softie set that is designed to bring the classic story to life. 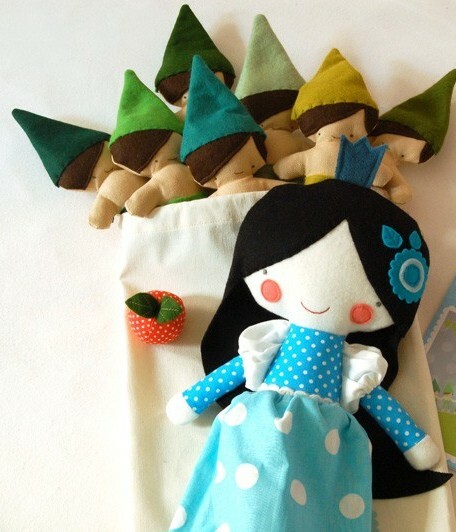 The set comes with the main characters, an apple, a little storybook and a bag to store everything in (brilliant!). The entire set is handmade in Portugal by crafter/illustrator/designer Ana Fernandes. Many happy hours playing, reading, hugging and snuggling are set to take place in the homes of Australia with these softies. The eleven piece set costs US$160 plus postage from PinkNounou.